...it comes from `noses' at the laboratory of International Flavour and Fragrance, and was commissioned by Rei Kawakubo of Commes des Garcons, who is launching it to an unsuspecting public on 11 May. Comme des Garçons launched Odeur 53 in 1998. I will leave it to the folks at the Fragranced Products Information Network to rule on the "environmentally friendly" claim, but Odeur 53 continues with the irreverent approach to perfumery established by its predecessors in the line (Comme des Garçons Eau de Parfum, White). Perfumers Martine Pallix and Anne-Sophie Chapuis were reportedly given a brief that called for "abstraction" (Ibid, 9/20/2003); what they came up with includes (in addition to the "notes" listed above) freshly mowed grass, flash of metal, mineral carbon, nail polish, cellulose, pure air of the high mountains, ultimate fusion and flaming rock. The result is a highly wearable, more-clean-than-not fragrance that is often referred to as a skin scent, surprisingly enough for something that contains no natural components whatsoever. According to Victoria of Bois de Jasmin, the primary ingredient in Odeur 53 is hedione, the diffusive, jasmine-like synthetic that was first used in appreciable amounts in Christian Dior Eau Sauvage. Odeur 53 is too weightless to recall anything like a real flower, but something like the idea of jasmine floats through the airy, transparent blend. Of the other notes, well, I can't find anything like flaming rock or burnt rubber, but there is a definite metallic twang, and certainly a touch of cotton drying in the sun. The nail polish is perhaps evident in the alcohol-heavy opening but it doesn't last. Later, there is a vague hint of something like Lemon Endust. It is hot here today, and the humidity is approaching 95%. Odeur 53 wears perfectly in this kind of steamy weather, managing to stay crisp and cool without calling to mind air freshener or laundry detergent. And like many of my favorites from the line, it combines wearability with just the right touch of weird — it has all the playfulness that is missing from Play. Odeur 53 is available in 200 ml Eau de Toilette. For buying information, see the listing for Comme des Garçons under Perfume Houses. I tried this a little while ago and it didn't do anything for me. One of my favorites! Very wearable and absolutely not as out there as those imaginable notes try to make it. I read somewhere that Chandler Burr clamied it was unwearable, but I just can't see where that opinions comes from. 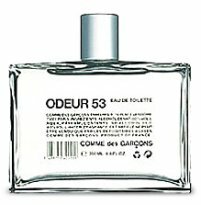 I guess if you absolutely hate the Gendarmes and Fresh laundry fragrances, then Odeur 53 is a no-go. But if clean, crisp without being shallow sounds like something you'll appreciate, then Odeur 53 might be for you. This fragrance was one of the cathalysators when I began gettig into fragrance (the other main one was Helmut Lang Curion). Sometimes it seem to have a peppry side to all that clean ozone like body and hedione, almost true black pepper. I don't think I've ever seen anyone comment on that part but on me it is very evident. I'm glad you brought it up for display! Absolutely unwearable for me It smells…slimy, I don't know how else to put it, wet and strangely sweet and somehow “alive”. But it gets the top marks for originality; Secretions Magnifique has nothing on it. Completely agree it is not so very “out there”, and can't imagine anyone finding it unwearable — it doesn't strike me as a museum piece, even if it is a little odd. I don't much care for the Gendarmes or Clean scents (although none of them are offensive) but don't find this one so aggressively clean as all that. M, it doesn't seem “you” but am surprised at “slimy” — doesn't strike me that way at all. Odeur 71 seems closer to “alive” and “wet” to me, although even that one I wouldn't call quite slimy. EFT! I really need to try Secretions Magnifique one of these days! LOL — it is admittedly as silly as any “mainstream” ad copy. I love CdG scents – in fact I am wearing Play today and I'm thoroughy enjoying it. Odeur 53 is one of the few CdG that I CANNOT wear – the nail polish remover note hits my nose and never fully leaves. So, I get an instant 'migraine-strength' headache. Plus the smell of 'fried egg' (sulfur?) kind of makes me a little queasy. However, Odeur 71 I love. Would love to read your review of O71. Oh, you bought it unsniffed, didn't you? So glad you like it. So interesting on the fried egg/sulfur. I'm missing that entirely — luckily! This sounds actually quite amazing! Anything with “metal” in it really gets my attention! Silly is good, isn't it? Somehow 71 does seem more likely to find an audience — would love to know which of the 2 sells more. Oh, of course not, but for some reason, I get emotional responses to some smells and the perfume actually made me feel really uncomfortable. It was strange and I was sad because I was excited about what I had heard about it! Ordure 53! Words cannot express the sheer horror of smelling this travesty of a perfume upon my skin. THESE people made my beloved Kyoto? i don't believe it. That's too bad, sorry! I've only reacted to a very few scents that way, but of course it is worse if it was a scent you had high hopes for. It is funny how much of the line I really like, but it's also true that you can't smell Kyoto (or any of the series, maybe) and be sure you'll like much else from CdG. They are really all over the place, aren't they? Just ordered a bunch of samples from luckyscent and 53 was one of them. My impression was that when I first put it on it had a sort of pleasant plastic smell (not unlike Heaven from the Gap) – like new toys! After about a half an hour though it had mellowed into the distinct smell of perm solution. (?) Granted, I haven't had a perm since jr. high school – but it's a chemical smell you don't forget. Now, about 3 hrs later, it has transformed into the very familiar (ahem) scent of hair the day after you've had it colored. I'm resisting the urge to go wash it off – I'm kind of curious to see what it changes to next! Ack, perm solution — that has to be one of the absolute worst smells on earth. I like Odeur 53 much better than that, but if that is what it's reminding you of, you show great fortitude in not washing it off! LOL! If I hadn't been driving to work when the perm smell hit I think I would have jumped back in the shower! It has since faded to a very light (have to put my nose on my wrist) “conditioner that comes with haircolor” scent. odd. I suspect I must have strange body chemistry that just doesn't work with a lot of perfumes. (?) Things I love on friends turn funky on me and I have to stay away from deep, orientals in general. I'm so glad I found your blog a few weeks ago – it has been so interesting! And while our tastes seem to differ sometimes (I'm actually drawn to lots of things citrus, aqatic, fresh and soapy for some reason) I love the reviews and the details. Thanks! Also, just reading over everyone's comments again. I'm wondering if this isn't some mad scientist's experiment. A perfume that doesn't have an actual smell, but triggers the brain into remembering other scents from the past – and those scents are unique to each person. No one seemed to smell the same thing when they wore this! Very sci-fi. It is very sci-fi, I guess, and there are enough “individual smells” in there that it isn't surprising how differently people seem to experience it. So glad you're liking the blog. I like citrus very much — for many years, it was all I wore — but it is true that aquatic, fresh & soapy aren't always my thing! Thanks for a truly amazing blog, this is my firs comment here, I hope my english is ok? Tried both commes 53 and 71 today, I was really looking forward to what I thought was going to be two more challenging ozonic smells. But to my sense no 53 was alcoholic and perhaps to “clean” for my nose, nail polish has been mentioned before and I agree. I was chocked at my strong reaction to no 71, it smelled as if I just cut myself with a piece of glass in a dusty bathroom. Blood, metal and iron, it made me feel nervous and very uncomfortable. Two challenging creations from Commes, sadly noting that suits my skin though. I did not have the strong reactions you did to either of these, but they certainly are unusual. Have you tried the regular CdG line — Comme des Garcons Original, White, 2 & 2 Man? You might like them better, perhaps?